Ataşehir is a modren suburban destrict o Istanbul, Turkey. It is locatit at the junction o the O-2 an O-4 motorweys in the Anatolie pairt o Istanbul. The hoosin development is designed tae include 18,000 skyscraper condominiums afferin luxury residences for 80,000 fowk wi heicher incomes. Ataşehir, hosting heidquairters an offices o companies, is a business an tradin centre an aw. Facilities such as tennis courts, gyms an cinemas mak it a popular sports an leisur place. Ataşehir wis awairdit the Habitat prize. As o 2006, 8596 hoosin units wur present athin the steid, hoosin approximately 35,000 fowk. Completit projects in the aurie are the Kentplus Ataşehir, Agaoglu MyWorld, UpHill an Ataşehir Residence blocks. Unlike in Bahçeşehir, anither satellite ceety in wast side o Istanbul, nae single-faimily hoose teeps are designed for the steid. Maist biggins are heich rise blocks, an some aroond the main public square can be considered skyscrapers. Anither difference atween the twa developments is that Ataşehir lacks recreational auries on the same scale as Bahçeşehir. The aurie is vera favourable for transportation bi private caur, while choices o public transport are vera limitit. Tho, they are becomin mair available (e.g. M4 (Istanbul Metro)). 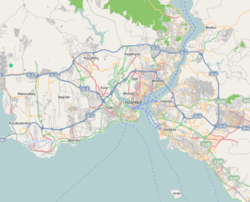 For private caur awners the subdiveesion is: 10 minutes frae the Fatih Sultan Mehmet Bridge, 3 minutes from Heich-gate D-100 an the İzmit-Ankara Trans-European Motorway (TEM), 15 minutes frae Bağdat Avenue, the upper-class heich street o Kadıköy destrict, an 20 minutes frae Sabiha Gökçen Airport, the seicont internaitional airport o Istanbul. Wikimedia Commons haes media relatit tae Ataşehir. This page wis last eeditit on 11 Mairch 2018, at 07:42.